I have another gender reveal goodie for you today! But if you read Monday's cookie post, then you know that I am not quite giving away any secrets just yet. You will have to come back later this week for the actual gender reveal. In the meantime, I thought it would be fun to go through some of those old wives' tales to "predict" the baby's gender. We'll see which ones are right and which ones are wrong at the end of the week. If you don't care about any of that, just skip down to "Recipes and Supplies" to see how to make the cupcakes. Sweet vs. Salty. Sweet cravings mean you are having a girl; salty cravings means you are having a boy. Verdict: Boy. Foot Size. Growing feet indicate a boy, while feet that stay the same size indicate a girl. Verdict: Girl. Mayan Gender System. The Mayan's used mom's age at conception and year of conception to predict gender. If both are even or both are odd, then it's a girl. If one is even and the other is odd, then it's a boy. My age at conception was even (although my birthday was probably the next week) and the year was even. Verdict: Girl. But if we use my lunar age, then it's a boy. I swear I didn't plan it to come out 50/50! If you want to throw out the Mayan method because it's somewhat inconclusive, then the remaining 13 wive's tales favor a boy. But barely! There were several other wives tales that I didn't test. Most of them involved taking urine samples or eating lots of garlic. No thank you! If you want to see a full list of these wives tales, I highly recommend this post. It's where I initially got this idea. There was one "wives tale" that I did use to predict baby's gender. Actually, I predicted this baby's gender years ago using this method. I will wait to tell you what that one is on Friday when I reveal the actual gender. Alright, enough about this baby...let's get onto the cupcakes! The beauty with these cupcakes is you can make just about any cupcake flavor you'd like! Sure, there are some exceptions like making a strawberry cake or anything tinted one color or another. But as long as the cake is a fairly neutral color (even chocolate would work) then it should work perfectly. One note on chocolate: if you do decide to go this route, you will want to make a small batch of vanilla just for the centers so that they can be dyed one color or another. Of course, if it's a girl you can make strawberry or red velvet for the centers. For a boy, blue velvet would also work. Or, if you want to go the boxed cake mix route, here are some tips to make it taste amazing! Start by making your cupcake batter. From the main batch of batter remove about 1 cup of batter and tint it the desired color. Pour the dyed batter into some sort of baking dish. It can be a small cake pan, sheet pan, or even several cupcake tins. You at least want whatever you are baking to be 1/2 inch thick. Bake the small batch of cake for 15-20 minutes, depending on size of the baking dish, or until the cake is fully baked. Remove the cake from the oven and let cool completely. To make cutting out the shape even easier, chill the cake for about 30 minutes. If the cake was baked in one flat layer, then just use a small cookie cutter in your preferred shape to cut out the centers. If you make cupcakes, slice the cupcake horizontally into 2-3 slices, then cut into shape. 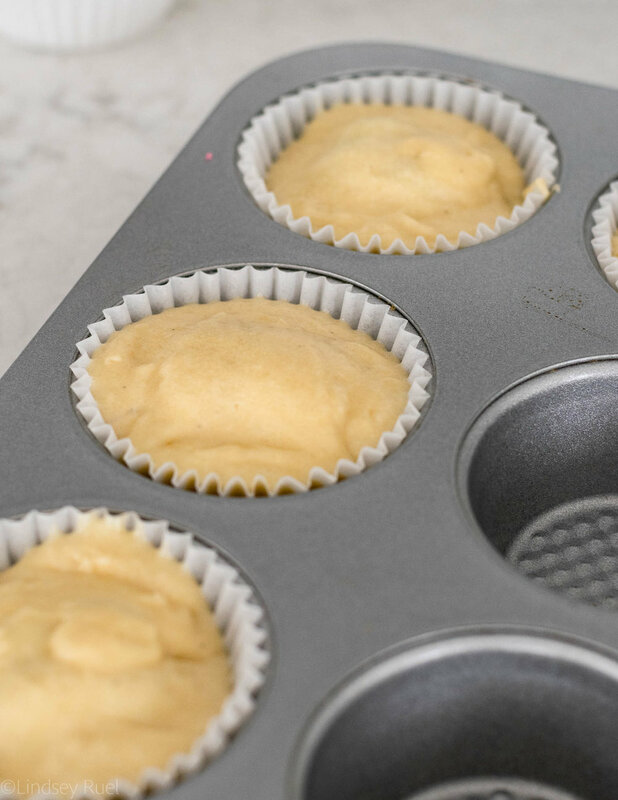 To assemble the rest of the cupcake, spoon a small amount of batter into the bottom of a lined cupcake tray. It should be enough to cover the bottom. Place the cut out cake into the batter, then spoon more batter on top so that it is covered. You don't want to overfill your cupcake tin (like I did). So try to keep it about 2/3rds of the way full. Bake the cupcakes for 20-25 minutes, or until the edges are slightly golden and a toothpick comes out mostly clean. While the cupcakes cool, make your frosting. You can make your favorite frosting recipe, but if you don't have one, here's mine! It's a delicious Swiss Meringue Buttercream that is light, airy, and not too sweet. To top these cupcakes, you will want both pink and blue frosting. 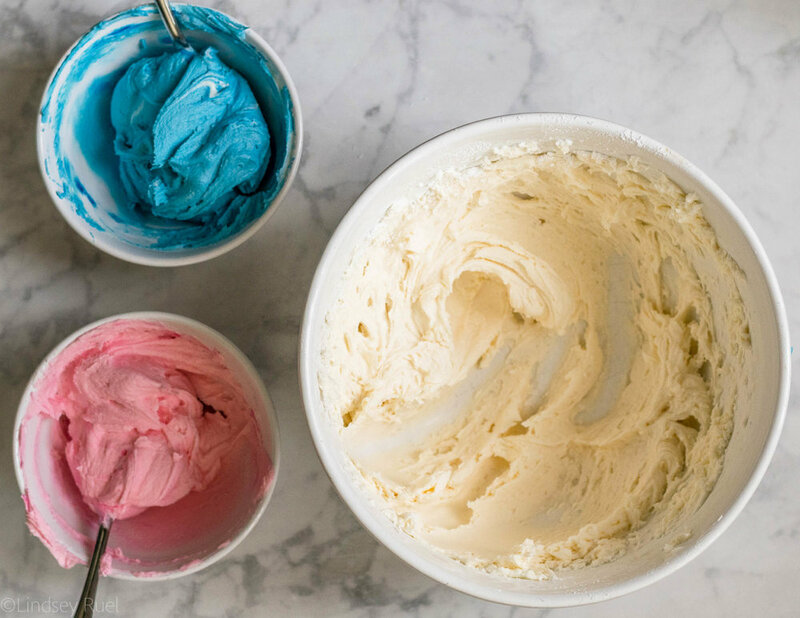 Remove about 2 cups of frosting from the main batch and place 1 cup in two separate bowls. Tint one blue and one pink. To get that swirled effect in the frosting, lay out a sheet of plastic wrap on your work surface. Spread a thick layer of pink, white, and blue in a line. Then roll up the plastic wrap in a tube and twist the ends. Snip off one end and place the whole tube into a piping bag fitted with your desired piping tip. Place the extra frosting into separate bags fitted with different styles of tips. To create a fun frosting decoration, I like to pipe the multicolored frosting in a spiral on top of the cupcake. Then I use the other colors to pipe little stars or dots around one side. Add some extra decoration by adding some multicolored sprinkles on top. Have fun with the decoration. There isn't any rhyme reason to it. I just tried to get each cupcake to be equally blue and pink. But you could also keep them stark white if you wanted! These cupcakes are just as easy to make two of as it would be to make a full dozen (or more), so I think these would be the perfect way to announce the gender to friends and family. Everyone can have their own cupcake and when they bite in they will get to see what color's inside! What do you think? Totally doable, right? I think they would be a great addition to any baby shower or gender reveal party!